While Amy was gone for a few days, I looked for rather obscure things to hike. The Deer Mountain Trail was one such object. I had drawn a map for cloudhiking on Deer Ridge a short while back, but I had never attempted the Deer Mountain Trail though it had always interested me. Note: Deer Ridge Trail ascends the west ridge of Deer Mountain from Deer Ridge Junction (junction of Hwys 34 and 36). The Deer Mountain Trail climbs the east side of Deer Mountain. Entering Rocky Mountain National Park, I started the hike from the trailhead at Upper Beaver Meadows. Following signs to Deer Ridge Junction, the trail shared a path with the Beaver Mountain Trail. It was an easy walk to the junction where the two trails separated. 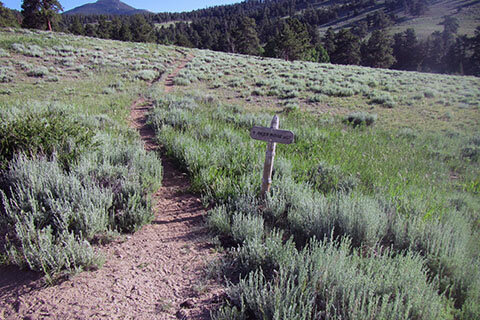 Taking the trail to Deer Ridge Junction, the trail crossed a drainage and then climbed steadily to the trailhead. At Deer Ridge Trailhead, I took the normal route to the summit of Deer Mountain. I started early in the morning and had the mountain almost to myself. The views from the summit and the other viewpoints along the way were excellent. 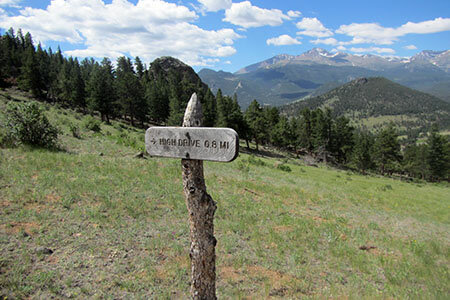 Returning from the short side trail to the summit, I left the Deer Ridge Trail and started on the Deer Mountain Trail - following signs to Estes Park. It was soon obvious that not many hikers chose to walk the North trail. 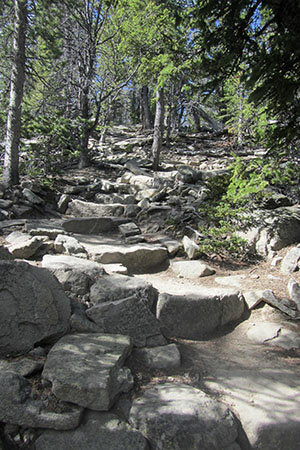 The trail was an excellent path that switchbacked toward Estes Park, but saw few boot prints. The views of Estes and the mountains abounded. The animals I saw on the path, almost seemed confused. I am assuming that so few hikers are on the trail that the animals were not sure who or what I was. 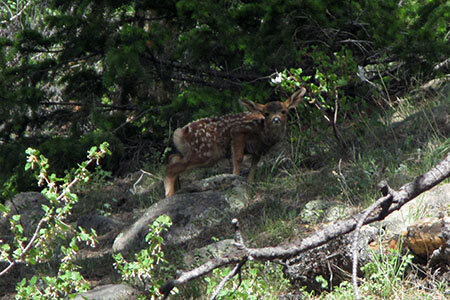 About a mile from the summit, I saw a mule deer doe and her fawn. Their ears are big even on the scared fawn. The trail continued to wind through the trees and into the high meadows. It was hot and windy as I passed small cliffs and boulders on the way to a saddle near a couple of rocky knobs. At a junction, I took the trail back under the south side of the mountain to return to Upper Beaver Meadows. At times the unsigned trails were difficult to follow. It did not seem natural for the trail to be so close to the private land and cabins. Returning to Upper Beaver Meadows, the GPS showed the total distance as 11.5 miles. It was a good hike on a few trails that I had never before walked. The Deer Mountain Trail was very good. I want to walk it again soon. The trails would be hot in full on summer heat. There are rumored to be a lot of ticks, but I did not see any. The Deer Mountain Trail was my favorite of the day. I want to return and climb the trail instead of descending it. It is also possible to connect to the Deer Ridge Trail using the North Deer Ridge Trail. I don't remember passing a water source until returning to Upper Beaver Meadows.